Ah, chili! One of the tastiest, most requested fall and winter dishes for many families. As days and nights turn colder, there’s nothing quite like a hearty bowl of delicious, spicy chili to warm you up from the inside out. 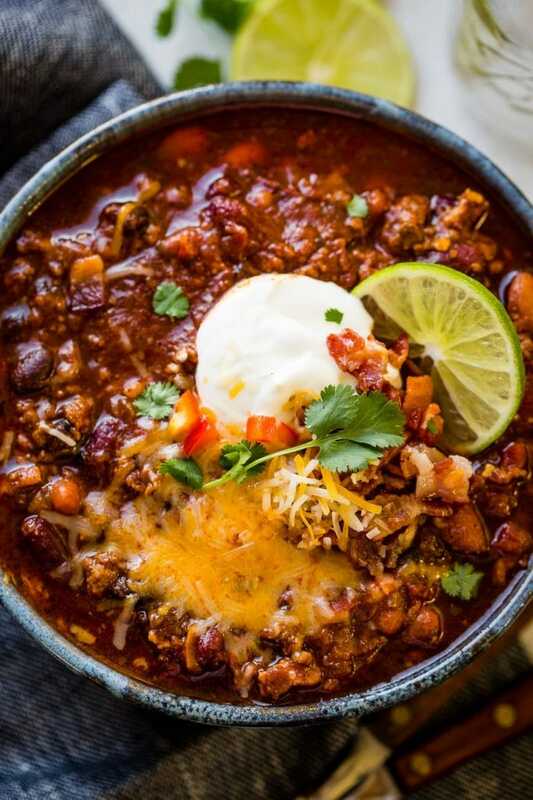 We found some pretty delicious recipes for this fall favorite we’d like to share, so read on for some chili recipes for chilly weather. First up, if you’ve ever wanted a meal starter that’s both delicious and unusual, have we got the appetizer for you! These absolutely irresistible Smoky Beef and Bacon Chili Nachos from Sunset Magazine are out of this world, combining a favorite cold weather food, chili, and a favorite year-round appetizer, nachos. This dish is sure to get you invited back to all the fall parties this year! Add beans and cook 10 minutes, uncovered. Season to taste with salt. Serve warm, with toppings on the side. Make this the day before and let the flavors fully infuse for extra flavor. Once you have your pot of chili warmed up (or freshly made, whatever your preference), it’s time to bring this ultimate recipe to life. Line a rimmed baking sheet with parchment paper, and then scatter your favorite tortilla chips on top. Liberally sprinkle grated sharp cheddar cheese on top and bake until cheese is somewhat melted. Remove from the oven and transfer to an oven-safe platter (the purpose of this step is to get the nachos on a presentable party platter instead of a baking sheet). Now top the cheesy chips with the chili. Top with more grated cheddar cheese and bake at a low heat to melt the cheese on top. Once you remove the platter, use a squirt bottle to top the nachos with a sour cream and lime juice mixture. Sprinkle on smoked paprika (for one last smoky touch) and chopped green onions. You can also apply your favorite hot sauce or leave that up to guests, so they can calibrate the spiciness to their liking. From our friends at The Wholesome Dish comes a traditional recipe for what they’re calling The Best Classic Chili. Just like mom used to make! Add the olive oil to a large soup pot and place it over medium-high heat for two minutes. Add the onion. Cook for 5 minutes, stirring occasionally. Add the ground beef to the pot. Break it apart with a wooden spoon. Cook for 6-7 minutes, until the beef is browned, stirring occasionally. Add the chili powder, cumin, sugar, tomato paste, garlic powder, salt, pepper, and optional cayenne. Stir until well combined. Add the broth, diced tomatoes (with their juice), drained beans, and tomato sauce. Stir well. Bring the liquid to a low boil. Then, reduce the heat (low to medium-low) to gently simmer the chili, uncovered, for 20-25 minutes, stirring occasionally. Remove the pot from the heat. Let the chili rest for 5-10 minutes before serving. Next up, from Genius Kitchen, author “Dee Licious” claims this is “The best bowl of chili I’ve ever had”. You just might agree once you try this recipe! our final selection, because the Instant Pot seems to be the kitchen appliance of the year, we chose the Award Winning Instant Pot Chili Recipe from Oh, Sweet Basil. Turn your instant pot to sauté and add the bacon, cooking until crisp, stirring often to cook evenly. 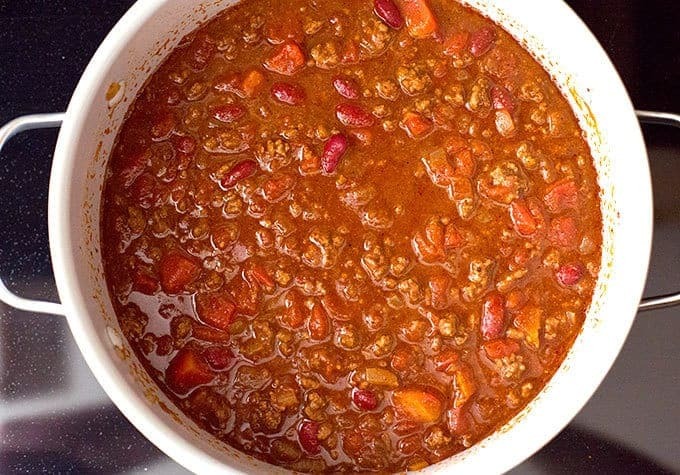 Turn the instant pot to chili setting and cook for 18-20 minutes*. Allow pressure to release for 10-15 minutes or quick release with the vent. *Most batches will be done after 18 minutes, however, we’ve had a few times when the flavor just wasn’t there yet, so feel free to pressure cook a little longer for more flavor or if your beans are not as tender as you’d like.